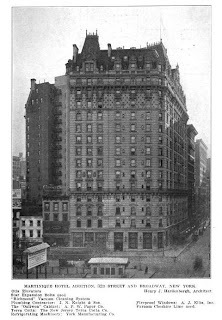 The Hotel Martinique designed by Henry J. Hardenbergh c. 1900 at Broadway and West 32nd Street in New York City. 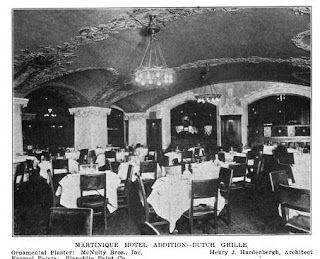 After the announcement of the building of Pennsylvania Station the Martinique's owner, William R.H. Martin, hired Hardenbergh to double the size of the hotel, which opened in 1910. The hotel is now the Radisson Martinique, click HERE to see it on google street view. Photos from Architects' & Builders' Magazine, 1910. Hardenbergh designed many similar hotels in NYC, including the Plaza Hotel and the old Waldorf Astoria, all in this wonderful style with high mansard roofs and extremely well detailed facades. This hotel became on of the notorious welfare hotels run by the city in the dark cash strapped days of the 60's and 70's. Rest assured, most of the period interiors have been thoroughly gutted, but there are hints of its former elegance. 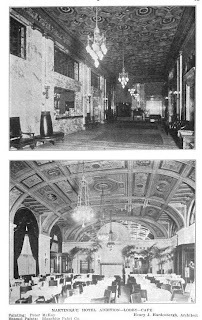 Pieces of the elaborate mosaic floors still exist in the entrance vestibule and sections of the main lobby area. The exterior though still impresses. I came on to say that myself, that I thought it was a welfare hotel in the 80s?